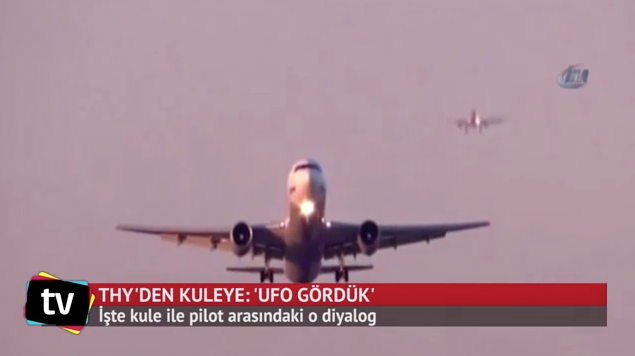 UFO SIGHTINGS DAILY: Radio Transmission From Pilot Over Istanbul Who Saw A UFO Released, July 2016, Video, UFO Sighting News. Radio Transmission From Pilot Over Istanbul Who Saw A UFO Released, July 2016, Video, UFO Sighting News. Now we have heard about this sighting back in May just a little bit, but now a reader of UFO Sightings Daily pointed out there is a first hand account of a pilot talking about the UFO over the radio to the control tower in Istanbul. Thats some good evidence that this did happen. Also the fact that the Turkish Pilots feared for their job if they reported the UFO...sound 100% authentic. All we need now is a word for word translation of the video. Turkish Airlines is the last night of a plane coming from the basement of the top pilots in the skies of Istanbul Silivri green light scattering with an unknown object passed. Turkish Airlines Bodrum-Istanbul route of the makes TK-2525 airliner aircraft pilots Gokhan K and loyal K. Istanbul Ataturk As they approached the airport 17 thousand feet (about 5 thousand meters) in height about 2 thousand in UFOs called an unknown object 23.30 order meters up to the top of the green light scattering is now rapidly disappearing, and they reported to the Ataturk Airport Air Traffic Control Center. TC-JHD tail registered Boeing 737 pilots to identify a body that passed the top of the control center said: "He flew over a green light" gave a report saying. conversation that passed between controllers and pilots: "As our two thousand or three thousand feet from (600-900 meters) has come in front of us an unidentified object green light scattering. He just disappeared one. Possible UFOs do we anticipate. He saw several Both pilots can not see at the moment" Airlines regarding this incident they experienced pilots in the State Airports Authority officials have said that there is no radar image. Turkish Airlines plane landed at Ataturk Airport in his hours of 00:37 after 30 minutes of purification of these instructions. "They say EVEN IN EUROPE" The pilot of the tower of his speech, a senior hurriyet.com.tr to review airliner pilot, "speaking style, to report anything unusual to normal," he said, but added: "Turkey also conveniently left UFO to be in the airspace. They say anything for fear of being humiliated in Europe."